Evolving Victorian Cemeteries of New Jersey ~ The History Girl! The nineteenth century ushered in a new way to bury the dead. Previously, those who died were buried in churchyards or family plots located on one's property. But overcrowding and unsanitary conditions within these church burial grounds led cemetery planners to rethink the way we bury our loved ones. The new design took the cemetery out of the control of the church, using an attractive park built on a grander scale, using architectural design and careful planting, inspired by the English garden movement. These cemeteries were often built on the outskirts of a town, surrounded by a stone wall and featured natural rolling hills, curved pathways, landscaping, and trees. Rural cemeteries, from their inception, were intended as civic institutions designed for public use. Before the widespread development of public parks, the rural cemetery provided a place for the general public to enjoy refined outdoor recreation amidst art and sculpture previously available only for the wealthy. These cemeteries often became the home of tall obelisks, spectacular mausoleums, and magnificent sculptures. One of the first cemeteries in New Jersey to embrace this new movement was the Jersey City and Harsimus Cemetery in the mid-nineteenth century. Formed in 1829, changes occurred in the 1850s to the cemetery property included landscaping of trees, plants and flowers, the addition of an iron gate, and the construction of a Victorian greenhouse. The cemetery transformed into more than just a burial ground. Families would spend the day at the cemetery, visiting the graves of loved ones and enjoying the well-manicured grounds and monuments. But not all cemeteries embraced the movement. Many changed slowly, embracing parts of the movement. Changes in grave marker design, one of the most prevalent items, can be observed in church cemeteries across New Jersey. Many of these early churchyards were limited in how they could physically change their property, so oftentimes the monuments and markers evolved, demonstrating a change in marker design and societal tastes. This article will briefly examine three cemeteries; two of which are associated with churches but embraced parts of the rural cemetery movement and one that was specifically designed as a large Victorian garden cemetery. Westminster Cemetery is located at the corner of Westminster Place and Maplewood Avenue in Cranbury, New Jersey. The burial grounds were established in 1838 for the congregation of the Second Presbyterian Church of Cranbury. This church, formed in the same year, split from the First Presbyterian Church of Cranbury. A number of stones predate the establishment of the church, possibly indicating that those interred were moved from family cemeteries or from the First Presbyterian Church's cemetery. Although this was strictly a church burial ground, the cemetery is somewhat of a hybrid between that and a rural cemetery, as it embraced the changing stone styles of the Victorian era. The Second Presbyterian Church was torn down in 1935 when the congregation merged with the First Presbyterian Church. The stones located near the now-extant church building are thin vertical marble markers, typical of the early to mid-nineteenth century. As the grounds expanded in the mid to late-nineteenth century, larger obelisks and family plots begin to appear. Although not designed or laid out in the manner of a rural cemetery, as there is very little landscaping and the ground is flat, the cemetery demonstrates a transition between the standard church burial yards and the rural cemetery design of the Victorian era. The cemetery is still in use today, but markers are now more modest and conformed, representing yet another shift in cemetery aesthetics. An overview of transitioning grave marker styles at Westminster Cemetery. Westminster Cemetery is host to two notable Civil War veterans. Joseph Miller McChesney, born September 25, 1838 in Trenton, New Jersey served as a Civil War Union Army Officer. He mustered as Captain of Company M, 9th New Jersey Volunteers on November 19, 1861. He was later transferred to Company A and promoted to Colonel of the 1st North Carolina (Union) Volunteers. He suffered a wound to his right knee at a skirmish in Washington, North Carolina. He resigned on May 13, 1865 and died at Beaufort, North Carolina on August 14, 1865 of complications from his wound. Edward B.P. Kelley, born July 4, 1835 served as surgeon in the 95th PA Volunteers and Medical Inspector for the United States Volunteers. He mustered out as Colonel of the U.S. Volunteers, Surgeon-in-Chief, 1st Division, 1st Corps Medical Division 6th Army Corps. He was also present at the surrender of General Lee and signing of the peace treaty at Appomattox Court House. He died November 25, 1891. Stones from the late 1800s at Westminster Cemetery, Cranbury, NJ. The Allentown Presbyterian Church Cemetery is located on High Street in Allentown, NJ. The congregation was founded in 1756. The current church was built in 1837 and enlarged in 1858. This is yet another church cemetery that expanded its burial grounds over time and adapted to changing times and tastes, showing a fine mix of stones from the eighteenth century through today. As expected, the earlier stones are situated around the church building. Further from the church, one can find a variety of markers documenting different periods. Although not laid out in the rural cemetery style, the rural nature of the area has lent itself to the cemetery. It is located alongside Connie's Millpond and has a gentle slope downhill toward the shores of the large pond that once supplied water-power to the Old Mill. Trees near the top and bottom of the hill provide a sense of enclosure and a handful of mature trees are located within the cemetery. The stones in this cemetery are spaced out with ample room between, creating a sense of openness, making it possible for families to come to the cemetery with a blanket and picnic basket for the afternoon as they reflect upon their loved ones. A number of obelisks and one large family plot with a wrought iron fence dating to 1861. The Allentown Presbyterian Church Cemetery evolved much like Westminster Cemetery in Cranbury, but its design and layout is inching closer to the rural cemetery style. Allentown Presbyterian Church Cemetery, Allentown, NJ. Notable burials include William Augustus Newell, New Jersey's 25th Governor. Born September 5, 1817, he graduated from the University of Pennsylvania where he was trained as a physician. He was a two-term U.S. Congressman in the House of Representatives and served as Governor from 1857 to 1860. During the Civil War, his medical training was called upon, as he served as the superintending surgeon of Monmouth County Militia. In 1880, he was appointed Governor of the Territory of Washington by President Chester A. Arthur, and served from 1880 to 1884. He died in Allentown, New Jersey in 1901. James Henderson Imlay of Allentown, born November 26, 1764, served in the New Jersey Militia during the Revolutionary War and in politics as a member of the New Jersey legislature and later as a U.S. Congressman in the House of Representatives. After the end of his term in the House, he practiced law and served as Postmaster of Allentown, where he died March 6, 1823. Family plot and marker for New Jersey Governor William Augustus Newell. Elmwood Cemetery, located off George's Road in North Brunswick, borders with New Brunswick. The cemetery was established in 1868 by a special act of the New Jersey Legislature and originally named Cedar Lawn Cemetery. The name was changed to Elmwood Cemetery in 1873. This cemetery was designed as a Victorian garden cemetery by the prominent, New Brunswick architect, George Parsell. He and Elmwood’s founders had a vision to create a beautiful final resting place for the deceased and a tranquil place of reflection for the visitor. Unlike the two previous cemeteries, it was not associated with a congregation and specifically built as a public space. The original layout for the cemetery included a gatehouse, numerous winding pathways, a lake created by damming a portion of Mile Run, and a large public park. The original layout may not have fully been realized, but the paths and gatehouse were constructed. These natural rolling hills dotted with memorials on the outskirts of New Brunswick must have been a very tranquil scene in the late nineteenth century. The gate house, now the cemetery office, is located just within the main entrance to the cemetery. It was built in the Queen Anne style during the late 1880s. It is a brick structure with a small corner tower made of wood and resembles a small chapel. Its architect is unknown but its style is similar to that of George Parsell. In 1917, a memorial chapel and receiving vault were built in the side of a hill near the center of the cemetery. The building, dedicated to Johnson Martin and Emma Ross by their children, was most likely designed by architect Alexander Merchant. Built of rusticated blocks of granite with arched windows and doors in the Gothic Revival style, it appears majestic and imposing. The Queen Anne gatehouse at Elmwood Cemetery. 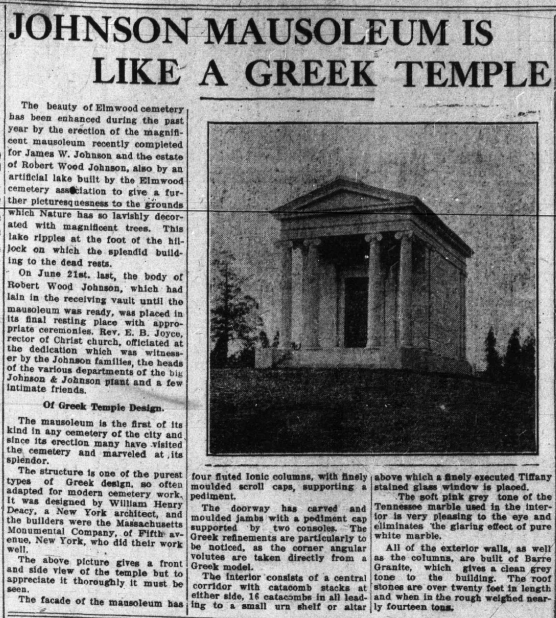 Along with family plots, mausoleums became popular for the wealthier during the rural cemetery movement. Unlike the two previous cemeteries, numerous mausoleums dot the far end of the property, including one very tall mausoleum for Christopher Meyer, a German immigrant who invented the first steam boiler for rubber processing. He helped start the New Brunswick Rubber Company, opened the Meyer Rubber Company in Milltown, New Jersey in 1843, and co-founded the North British Rubber Company, a forerunner of the Michelin Company. Another notable family at rest in Elmwood is the Johnson family. 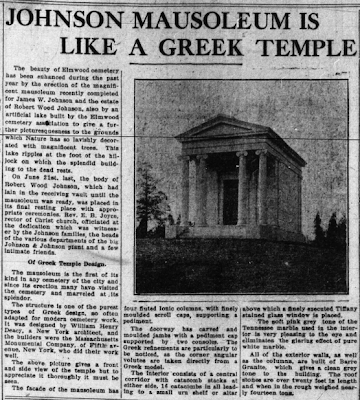 James Wood Johnson, one of the founders of Johnson & Johnson, and Robert Wood Johnson, II, son of Robert Wood Johnson are laid to rest in a Greek Revival mausoleum. Completed in June 1911, it was designed by William Henry Deacy, a New York architect. Robert Wood Johnson, II started in family the business at the bottom, alongside the common workers and took over for his father at the age of sixteen. He served as President of Johnson & Johnson for six years, and chairman of the board from 1938 to 1963. Johnson served during World War II as Brigadier General in charge of the New York Ordnance District. This would earn him the name he would be known by for the rest of his life: "The General". He resigned his commission to accept the appointment of vice chairman of the War Production Board and chairman of the Smaller War Plants Corporation. Article from the New Brunswick Daily Home News, October 17, 1911.
Notable Civil War veterans include Hugh Hartshorne Janeway. Janeway, born November 14, 1842, was a graduate of Princeton University and served as a Civil War Union Army Officer. He served as Colonel and commander of the 1st New Jersey Volunteer Cavalry. Janeway died April 5, 1865 at Amelia Springs, Virginia. John T. Hill enlisted in the Union Army as Captain and commander of Company C, 11th New Jersey Volunteer Infantry on July 26, 1862. Captain Hill was transferred to the 12th NJ and promoted to Major. He led the 12th New Jersey through the Gettysburg campaign, and played a significant part in the fighting on July 2 and 3, 1863. On the third day of the battle, his regiment took part in the repulse of Pickett's Charge. Today two monuments stand in the Gettysburg National Military Park for the 12th New Jersey Infantry. Major Hill would survive the battle and lead his Jerseymen in the Mine Run Campaign. He resigned on February 24, 1864 due to poor health. He died March 1, 1891 at the age of fifty-three. John Baillie McIntosh was a Civil War Union Brigadier General. Born in Florida in 1829, he joined the Union Army as a Second Lieutenant in the 2nd US Cavalry. He fought in the Peninsula and Maryland campaigns and was made Colonel of the 3rd Pennsylvania Cavalry. He commanded the 2nd Brigade Cavalry Corps at Kelly's Ford, Chancellorsville, Gettysburg and was promoted Brigadier General in July, 1864. During the 3rd Battle of Winchester in September 1864, he was wounded, which resulted in the loss of a leg. Following the war, he remained in the military serving as governor of Soldier's Home in Washington DC and superintendent of Indian affairs. He retired as a Major General and died June 29, 1888 in New Brunswick. For more information about New Jersey cemeteries, gravestones and carvers, read New Jersey Cemeteries and Tombstones: History in the Landscape, a well-researched book by Dr. Richard Veit and Mark Nonestied.